Wrought Iron Furniture - Wrought Iron Spider Table with Support Bars to support heavy Glass, Granite or Marble Top. 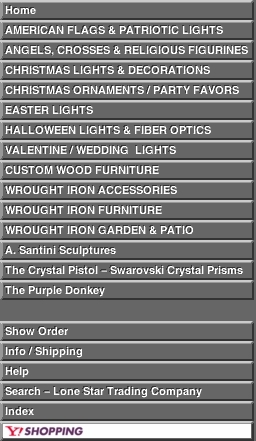 Wrought Iron Furniture & Accessories. Wrought Iron Furniture shown in rust can be clear-coated, painted or antiqued. We usually do this on a per request basis. You may want to refinish the piece yourself. If you want Lone Star Trading Company to finish the piece for you please make a request via e-mail or call us toll free at 1+ (888) 883-9971 and we will discuss finishes and cost with you. If you send us an e-mail please include a contact phone number, if possible. Thanks.